ANNAPOLIS, Md. 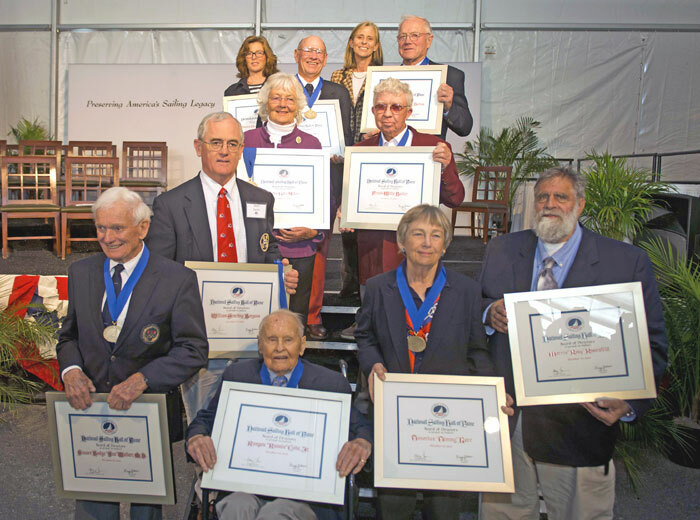 — The National Sailing Hall of Fame (NSHOF) inducted 10 of the sport’s significant heroes during its 2013 ceremonies — held for the first time in the organization’s hometown, and on the site of its future facility at City Dock in the historic waterfront district of Annapolis. The previous induction ceremonies, reflecting the national scope of the organization, were held in San Diego and New Orleans. The 2013 induction ceremony, held Oct. 27, was dedicated to the U.S. Naval Academy, with which the NSHOF has partnered in its quest to preserve America’s sailing legacy, embed sailing in education and recognize sailing’s heroes. This year, six living sailing legends were celebrated for their impact on the sport, including two from the West Coast. Hall of Fame inductee and Catalina Yachts founder Frank Butler of Woodland Hills created one of the largest boat manufacturers in the world and developed the Catalina 22, one of the most popular sailboats in America. The California native started his career in the Navy, and later opened Wesco Tool, which made airplane parts. His knowledge of the airplane industry would later be evident in his first notable boat design — the Coronado 25. “I am so proud to sit with these superstar sailors,” Butler said, referring to his fellow inductees assembled for the Oct. 27 ceremony. “I remember when I built my very first boat,” Butler recalled. “I was about 12 or 13 years old … I never thought at that time I’d be building 60,000 boats. Inductee Bill Buchan of Medina, Wash. is best known in sailing circles as a three-time Star World Champion (1961, 1970 and 1985) and 1984 Star Olympic Gold Medalist. He can also lay claim to Olympic sports trivia: He was 49 years old in 1984, making him the oldest member of the entire U.S. Olympic Team across all sports. And as he won his Gold Medal in the Star class, his son, Carl Buchan, was winning one in the Flying Dutchman class at the same games. “If it wasn’t for Seattle Yacht Club arranging for the 1948 Star North Americans, I wouldn’t be standing here today,” said Buchan, whose parents had immigrated to Seattle from Scotland in the early 1920s to work in the fishing industry. When the Star caught Bill’s eye, his father, who built houses and boats in his spare time, built a Star for his son and then crewed for him. By the time they built a third boat, they had figured out how to make it fast. By 1954, Bill had become a builder of record for the Star class — and the improvements he made to the build process over the years are evident in the use of the Buchan hull shape by current-day builders. Three-time U.S. Women’s Sailing Champion and two-time Yachtswoman of the Year (1961 and 1965) “Timmy” Larr of Oyster Bay, N.Y. is only the second woman to be inducted into the National Sailing Hall of Fame. “To be even considered to be in this group of superstars … it’s unbelievable,” she said. A naval architect, Larr’s competitive accomplishments in the 1960s put her at the forefront of the sport, at a time when it was rare to see a woman at the top of the podium. More recently, her pioneering contributions in standardizing the sail training program in the U.S. was the catalyst for similar programs for judges and race committee officials. Larr established the National Junior Sailing Symposium and assisted in the formulation of the Small Boat and Keelboat Certification Systems, as well as the new Powerboat Program. She also co-authored or contributed to the textbooks and instructor manuals used in the Certification Systems. Her efforts in maintaining high quality standards for sail training have earned the programs the respect of the Coast Guard, U.S. Power Squadrons and National Association of State Boating Law Administrators. These systems have helped thousands of people of all ages to learn to race, cruise, teach and coach — always with safety a paramount consideration. Larr was awarded the Nathanael G. Herreshoff Trophy — for outstanding contribution to the sport — by US Sailing in 1992. The sailing resume of inductee Dave Curtis of Marblehead, Mass., a two-time ICSA All-American (1967 and 1968) while at Tufts University (from whence he graduated in 1968 with a B.S. in Mechanical Engineering), is replete with one-design titles in a number of classes. Significant among them: the Soling World Championship in 1981, two Soling North American Championships (1999 and 1997), and the J/24 World Championship in 1984, as well as Gold medals at the Pan Am Games in two different classes: J/24 (1983) and Soling (1979). The seven-time Etchells World Champion and two-time Rolex Yachtsman of the Year (1981 and 1983) has made a career as a sailmaker known for building fast sails. Inductee Runnie Colie Jr. of East Windsor, N.J. has a reputation as one of the nation’s foremost dinghy sailors, which he earned sailing Penguins — the double-handed dinghy of choice in the 1940s and 1950s — and E-Scows. He is a seven-time International Penguin Champion and eight-time E-Scow Champion. A fierce competitor, Colie started sailing at age 9. Through the decades, he also left his mark in the Sunfish, Moth and 5.5-Metre classes. “I want to tell you how much I enjoy sailing,” said the 97-year old Colie, who added that he also liked to instruct people. Colie’s impact is evident on sailors who have sailed with or against him, as many of those sailors quote him when teaching others to sail. His “never quit” attitude, dedication, and attention to detail had a profound effect on many sailing careers. Committed to the education of the next generation of sailors, Colie established the Carl Van Duyne Memorial Advanced Racing Clinic to honor the life of his good friend who died at the young age of 36 in 1986. Held annually for junior sailors, the clinic’s focus is not only on boat handling and tactics, but also sportsmanship, a facet of sailboat racing that both Colie and Van Duyne embodied. A retired professor of pediatrics and a 1968 Olympian, Walker has authored numerous books on the sport and has been a regular contributor to Sailing World magazine. In addition, he was a primary founder of the Severn Sailing Association. The National Sailing Hall of Fame Induction celebration also recognized, posthumously, the contributions of four notable sailors. Tom Blackaller (1940-1989) started sailing at age 10, when his parents moved the family from Seattle to San Francisco. His notable successes in the Star class began in 1968, when he won the Silver Star at the Western Hemisphere Spring Championship, followed by a second Silver Star at the North American Championship. He would go on to win the Star World Championship twice (1974 and 1980). In 1973, he won the Six-Meter Gold Cup — the class world championship. Fame in the sport accompanied his three 12-Meter campaigns for the right to defend for the America’s Cup, losing to rival Dennis Conner each time. He worked as a sailmaker, had a larger-than-life persona, and was also known for racing sports cars. W. Starling Burgess (1878-1947) was the son of Edward Burgess, designer of America’s Cup defenders in 1885, 1886 and 1887. Starling Burgess exhibited his innovative perspective with the design of the revolutionary 52-foot scow sloop Outlook in 1901 during his senior year at Harvard University. Burgess, who did not complete his degree at Harvard, expanded his design efforts to aircraft and motoryachts, and through his own aircraft company became one of the first pilots to take off and land on water. In 1905, at the age of 27, he established a boatyard in Marblehead, Mass. John Gale Alden (1884-1962), who was born in Troy, N.Y., spent his summers in Sakonnet, R.I. before the family relocated to Dorchester, Mass. in 1900. An anecdote from his childhood (age 12 or 13) describes how he took a 21-foot Knockabout and sailed it alone from Troy, down the Hudson, to Rhode Island — roughly a 300-mile trip. First and foremost a sailor, Alden, by age 18, had worked briefly for Starling Burgess before winning an apprenticeship with B.B. Crowninshield of Boston, the preeminent yacht designer of the day. Alden’s design talents came to prominence with the success of his Malabar design, which won the Bermuda Race in 1923, 1926, and 1932, with his hand on the helm each time. Through the 1950s, his firm produced more than 900 designs — including fireboats, trawlers, motorsailers and power yachts. Morris Rosenfeld (1885-1968), who in following his artistic interests and not his parent’s wishes that he become a doctor, went on to become the foremost marine photographer of his time. Born in Hungary, Rosenfeld grew up in New York and was taking his first photographs at age 13 with an ancient box camera. By age 19, he was recording the sport of sailing. He worked with the leading yacht photographer of the day, Edwin Levick, and studied art at Cooper Union. In 1910, he established his own studio in Manhattan. His love of the water led him to concentrate his photography on maritime activities that would eventually become the centerpiece of a historical collection — acquired in 1984 by Mystic Seaport — of still images of the sport that capture the grace and action of a bygone era. Following a two-month period this spring, during which sailors from across the country nominated their choice for induction, a selection committee made up of representatives from US Sailing, the sailing media, the sailing industry, community sailing, a maritime museum, a previous inductee and the NSHOF Board reviewed the broad spectrum of nominations. Inductees are American citizens, 45 years of age and older, who have made significant impact on the growth and development of the sport in the U.S. in the categories of Sailing, Technical/Design and Contributor (coach, administrator, sailing media). Nominations of non-citizens were also considered if they influenced the sport in the U.S., and posthumous nominations were also accepted. The undertaking to recognize Americans who have made outstanding contributions to the sport of sailing is central to the mission of the NSHOF, which was formed in 2005 and has completed phase one of its plan to establish a permanent facility on the historic waterfront of Annapolis. The National Sailing Center & Hall of Fame is a not-for-profit educational institution dedicated to preserving the history of the sport and its impact on American culture; honoring those who have made outstanding contributions to the sport of sailing; the teaching of math, science and American history; inspiring and encouraging sailing development; and providing an international landmark for sailing enthusiasts. The NSHOF has partnered with US Sailing and the U.S. Naval Academy, and is associated with yacht clubs throughout the country, in its efforts to recognize role models of outstanding achievement. For more information, visit nshof.org.? ?